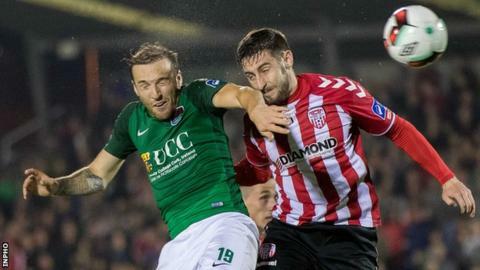 Cork City have been crowned League of Ireland champions and Derry City have secured a Europa League place after the sides drew 0-0 at Turner's Cross. The match was initially due to take place on Monday but was rescheduled for Tuesday because of the storms which caused extensive damage across Ireland. Cork collect the title for a third time, their first championship success since 2005. They were unbeaten in their first 22 games but won one of their last seven. Cork won the FAI Cup last season and will hope to complete a league and cup double when they face Dundalk in this year's showpiece decider at the Aviva Stadium on 5 November. The newly crowned champions required just a point from the encounter to claim the title with two rounds of fixtures to spare, while for Derry a draw was enough to seal at least fourth in the Premier Division table and with it a European place. It was a match of few chances but it was the visitors who fashioned the better scoring opportunities in the first half, Rory Patterson's attempt to chip Mark McNulty forcing a good save from the home goalkeeper and Harry Monaghan flashing a header over the bar from six yards. Just before the break, Ger Doherty palmed away Gearoid Morrissey's effort. Derry's final two fixtures of the campaign are away to Sligo Rovers on 21 October and home to St Patrick's Athletic on 27 October. Tuesday night's game got the go-ahead on Monday despite one of the stands at Cork's home ground having suffered extensive storm damage. The roof of the Derrynane Stand collapsed onto the seating area below, which had left the match in doubt.